Manually Issuing Store Credits in Vend – How can we help? Sometimes you might need to issue store credit that is not tied to a return, such as a courtesy or special promotion for valued customers. Important: If you use Xero with Vend, do not issue manual store credit if you have not properly mapped store credit in your Xero mappings page in Vend. For information on how to do this, click here. To manually add store credit to a customer, navigate to the sell screen and type the customer's name or code into the search box. Hit enter or click on the customer's name to add it to the sell screen. Click on the customer name on the right-hand side of the screen to bring up their customer info, including their current store credit balance. At the bottom of this window, you will see an Issue Store Credit button. 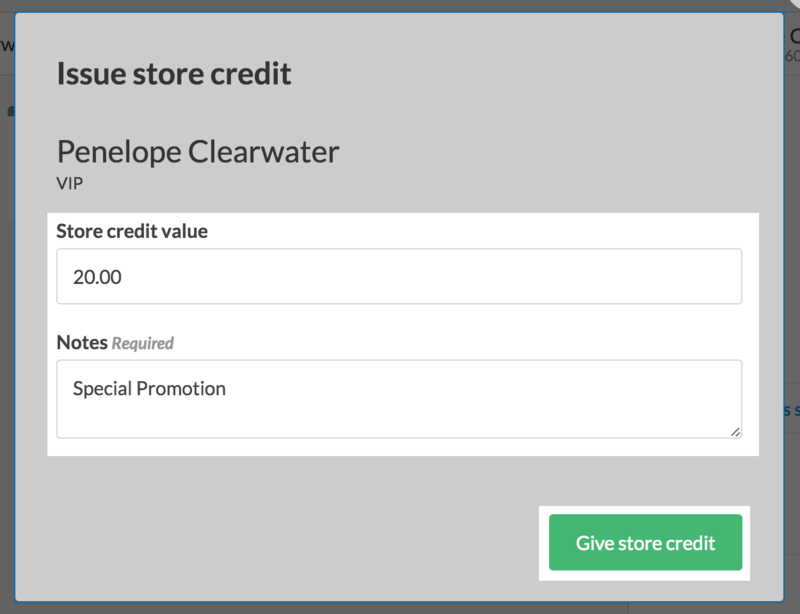 Click this to add store credit to your customer manually. Store credit value: This is where you put the amount of store credit you'd like to add to the customer. Notes: In this field you'll need to add some detail around the store credit you're adding. Why you are adding this store credit to the customer's account for example. Once you've filled out these fields, click the Give store credit button to add the store credit to your customer's account. 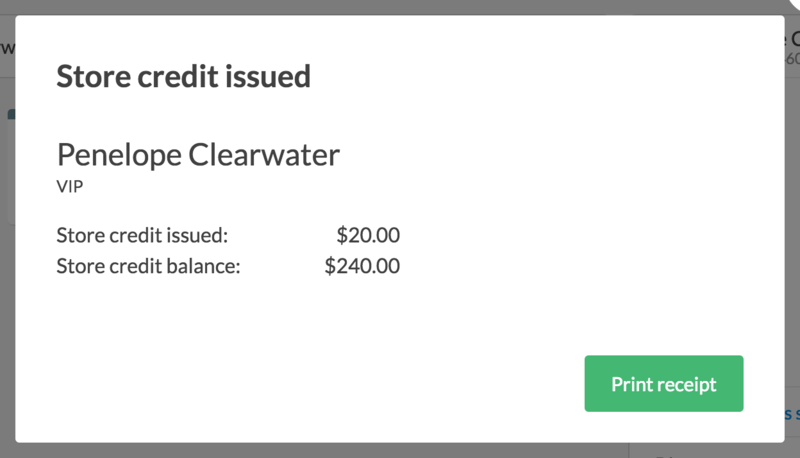 Your customer's updated store credit balance will be displayed, and you will have the option to print out a small receipt confirming this update. If you intend to use manual store credit with Vend and Xero, you will first need to check that two mappings are set correctly in your Vend - Xero mappings page. 1. Head to Setup -> Add-ons and click on the 'Settings' button next to Xero. You should now be in your Vend - Xero Mappings page. 2. Navigate to your 'Accounts for Liabilities and Expiry' section and choose the Xero liability and expense accounts you wish to map under Store credit liability and Store credit expense respectively. Once this has been mapped correctly, Vend will debit the store credit expense account and credit the store credit liability account in Xero as soon as you issue manual store credit to a customer. Important: Posting this information will create a journal entry in Xero. It will not create an invoice. What if my manual store credits failed to post to Xero? If your manual store credits have failed to post to Xero, you will receive an error message. This message will appear on the store credit report page if you have any store credit that has failed to post to Xero. On this page, you will be given the option to re-post the failed transaction(s) to Xero. You will also receive a notification identifying the error has occurred. You can also control which of your store's roles can issue manual store credits. 1. Navigate to Setup in the side-menu and choose Users. 3. On the roles page you will see your three user roles; Cashier, Manager and Admin. Click on one of these roles to customise whether or not they'll be allowed to issue manual store credit. If a user does not have permission to use manual store credit, the manual store credit button will not display as on option on the store credit tab.